The eyes of a Mantis shrimp are mounted on mobile stalks and can move independently of each other. Mantis shrimps can see objects with three different parts of the same eye, giving them ‘trinocular vision’ so unlike humans who perceive depth best with two eyes, these animals can do it perfectly well with either one of theirs. Their colour vision far exceeds ours too. The middle section of each eye, the midband, consists of six parallel strips. The first four are loaded with eight different types of light-sensitive cells (photoreceptors), containing pigments that respond to different wavelengths of light. 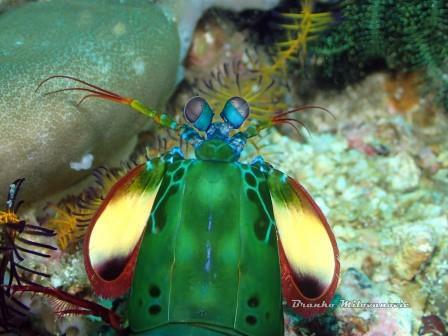 With these, the Mantis shrimp’s visible spectrum extends into the infrared and the ultraviolet. Mantis shrimp come in a variety of species around 400. Stomatopods from different species range in size from smaller than an inch to longer than a foot. They’re usually classified by murder method — either smashing or spearing. Spearing Mantis have two sharp appendages on the front of their bodies built for harpooning prey. Spear-wielding Mantis shrimp don’t move as fast as their club-fisted counterparts (their strikes are about 10 times slower), but the threat of death by impalement is intimidating on its own. The Smashing Mantis are famous for their powerful forearms, which can throw the fastest punch on the planet. The arm can accelerate through water at up to 10,000 times the force of gravity, creating a pressure wave that boils the water in front of it, and eventually hits its prey with the force of a rifle bullet. So watch out for your camera lens!